Life’s Better at the Beach! Explore more than 400 square kilometres of water on Alberta's seventh largest lake, and enjoy the beauty of the Cold Lake Marina and Kinosoo Beach. Named one of Canada's top 25 beaches by Canadian Geographic Magazine, Kinosoo Beach is a three block stretch of fine sand on the City of Cold Lake's north end. How to get here? After you enter Cold Lake’s main shopping areas keep heading north on Highway 28. Go past the turn off to Highway 55 and follow Highway 28 all the way to Lakeshore Drive and Cold Lake Marina. 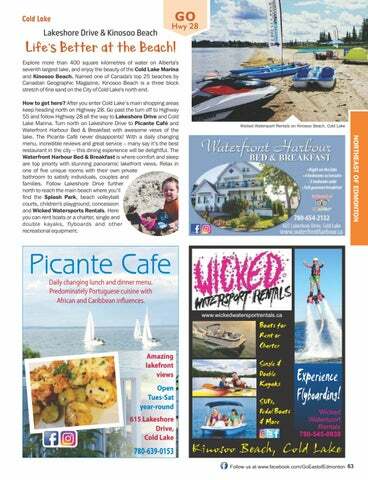 Turn north on Lakeshore Drive to Picante Café and Waterfront Harbour Bed & Breakfast with awesome views of the lake. The Picante Café never disappoints! With a daily changing menu, incredible reviews and great service – many say it’s the best restaurant in the city – this dining experience will be delightful. The Waterfront Harbour Bed & Breakfast is where comfort and sleep are top priority with stunning panoramic lakefront views. Relax in one of five unique rooms with their own private bathroom to satisfy individuals, couples and families. Follow Lakeshore Drive further north to reach the main beach where you’ll find the Splash Park, beach volleyball courts, children's playground, concession and Wicked Watersports Rentals. Here you can rent boats or a charter, single and double kayaks, flyboards and other recreational equipment. Picante Cafe Daily changing lunch and dinner menu. Predominately Portuguese cuisine with African and Caribbean inﬂuences.